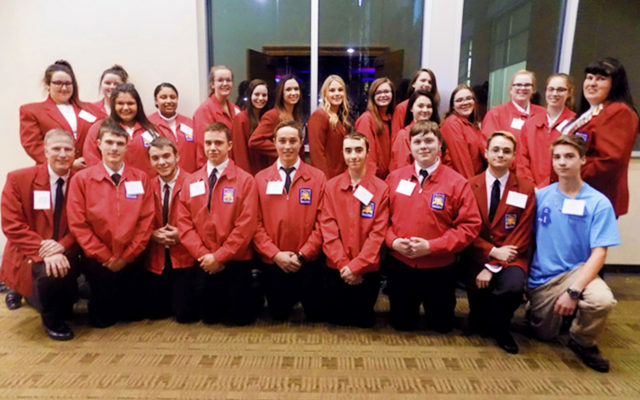 Kevin Lavoie, Director of the St. John Valley Technology Center in Frenchville, has announced that 22 students competed in the 2019 SkillsUSA competitions held in Bangor on March 7-8, 2019. Kevin Lavoie, Director of the St. John Valley Technology Center in Frenchville, has announced that 22 students competed in the 2019 SkillsUSA competitions held in Bangor on March 7-8, 2019. Silver medalists were Jacob Vereneau, in Courtesy Corps; Sylvie Guimond, Health Occupation Portfolio; and Harley Carter, Job Skills Demo O. Bronze medalists were Molly Jerkins, Alyssa Raymond and Alexis Lovley in the Promotional Bulletin Board contest. Particpants were, from left, front row: SJVTC Director Kevin Lavoie, Riley Morneault, Lucas Lizotte, Andrew Nadeau, Michael Hebert, Jacob Pelletier, Kobe Chasse, Austin Dechaine and Jacob Vereneau. Back row: Molly Jerkins, Rikki Ouellette, Ariana Hebert, Heather Whitley, Lakota Bouchard, Alyssa Raymond, Alexis Lovley, Sylvie Guimond, Kaitlyn Martin, Madison Nadeau, Katelyn Ouellette, Paige Paradis, Harley Carter, Amber Sandstrom and Marie May Chasse, instructor. Instructors missing from photo are Mitchell Daigle, Chris Haskins, Pam Caron, Kevin Daigle and Dale Voisine.